Kenya suffered the highest casualties in the Ethiopian Airlines Boeing 737 plane crash on Sunday, but somehow a leading American media outlet didn’t consider the grim statistics as a major news highlight. 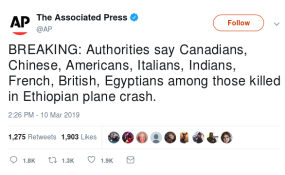 Instead, the Associated Press (AP) mentioned Canadians, Chinese, Americans, Italians, Indians, French, British, Egyptians casualties as it broke news of the plane crash on Sunday. That tweet did not go down well with Twitterati who called out AP for the lack of proportional representation of everyone who was on board. AP is yet to delete the tweet or apologise.